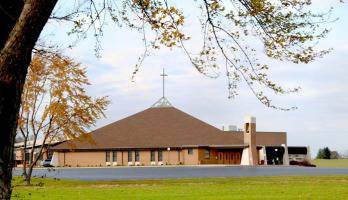 Hello you have reached St James Catholic Parish is the voice you hear when you call the Church. My name is Rene Ranic and I work as your parish secretary. I can not believe that is has already been 13 years full time and 2 years part time. We moved to Mukwonago 15 years ago from West Allis. John and I have been married for 31 years and we have 2 children, Corinne age 23 and Josh age 19 and two dogs who are the best of buds named Bubba and Maci. John works at Seider Heating and sells furnaces and air conditioners. He has been in this field for over 35 years. Our whole family enjoys the outdoors from summer fishing, skiing and boating to winter hunting, ice fishing and snowmobiling. We are thankful that we share a family place up north in Crivitz to take part in the great outdoors. I love to take vacations as everyone in the office knows I do. I never have a problem using all of my vacation time. The picture that you see was on a trip John and I took back in March to the West Indies on an island called St Kitts. 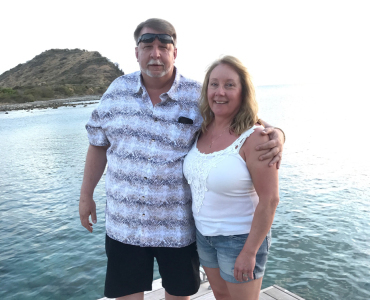 We had a wonderful time exploring the island, shopping at the port and just relaxing in the warm Caribbean sun. Of course we would go back! My favorite thing to do is to catch a Brewer Game at Miller Park. When I can’t get to the ball park I love to listen to the game on the radio or watch it at home. I know some of you may have stopped in the Parish Office when the game was on. Even though are season ended in September, watching all of those young new players was so much fun. We will be back next year and I have a good feeling that we will make it into October. Feel welcomed to stop by the parish office during the work week and say Hi.